The 10 Best Garden Centers and Nurseries in Missouri! Whether you are looking for a gift for mom or a new look for your lawn, there are hundreds of options in Missouri. The best bet for a healthy and vibrant selection is to go to a local garden center or nursery. In Missouri, the variety of places to go is abundant and you might need a little help in choosing a great shop. Here are the 10 best garden centers and nurseries in the state. About an hour west of St. Louis, this nursery has a variety of gardening tools and plants to fill your needs. With a long history in the nursery business, the Hillermanns have kept up with the times and have a great website and Facebook page set up for you to see what types of items they sell. If you are in the neighborhood, then you should stop in during business hours to explore their family-operated shop. For those looking for something to do, they also offer classes for the young and young-at-heart that explore topics like floral arrangement and making mini gardens. Close to Lee’s Summit, this garden center has a rich history as a family owned and operated business since 1972. Their story on their Facebook page explains that they started as a little fruit stand and now is housed in an 80,000-square-foot facility, offering guests the opportunity to shop for a vast selection of plants. Not only do they have a variety of plants and knowledgeable staff, they also allow dogs at their business. So, if you are out with your favorite pooch, you can go plant shopping with your pet here. This store has a full-service landscaping contractor, a nursery, and retail garden center to help with your gardening needs. From sod for those bare patches in the yard to spectacular flowering shrubs, the staff is ready to assist you in finding the right plant for you. The owner, David Sherwood, is constantly updating his shop with seasonal selections and can guide you on choosing the right ones to attract butterflies and other pollenating creatures to your garden. Check out their Facebook page for their latest offers and to learn more about their daily selection. With a large selection of quality plants and materials, this family-owned business lets you shop for the perfect new addition to your home or garden. The serene atmosphere of their business gives you the chance to enjoy the beautiful fountains, while looking at possible landscaping ideas. Let your imagination run wild as you enjoy the vast hues of every color in the rainbow in their greenhouse area and you can always ask their staff if you need help with your purchase. If you are looking for something that will suit a smaller sized yard, then this is the place for you. 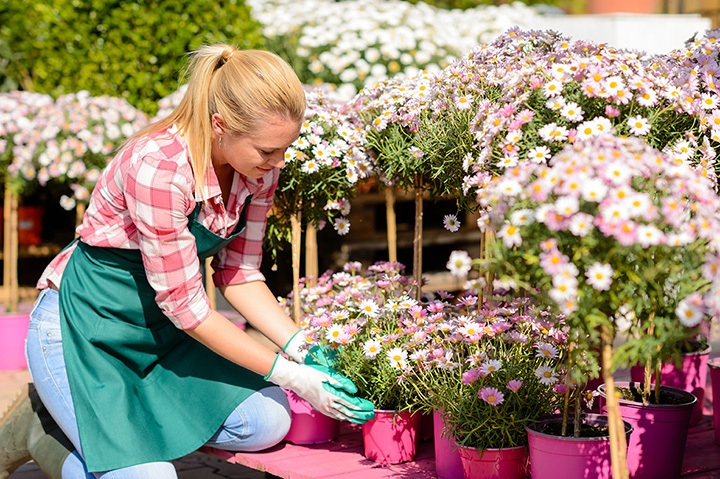 This garden center is in a well-established metropolitan area and offer plants and trees/shrubs that will be just the right size for smaller yards. On their Facebook page, they note that they provide a variety of herbs, annuals, perennials, vegetables, and even tropical plants. Stop in if you are looking for a unique shopping experience in St. Louis. Established in 1947, this nursery and garden store has provided the local area with a variety of perennials, annuals, and trees. The shop is located just outside the city of St. Joseph on Highway 6 and is easy to spot from the road, with its huge selection of potted plants and fountains out front. With its variety and friendly staff, it’s no wonder why this store was voted this year’s Reader’s Choice award winner for favorite gardening center in St. Joseph, Missouri. For over 20 years this gardening center has provided the Kansas City area with landscaping and a great selection of shrubs, trees, and perennials. They have knowledgeable staff onsite to help you decide what plants will fit your needs. On their website, they even give great advice on what flowers will help you turn your yard into a home for butterflies and hummingbirds. Plus, they include a sample list of what they have at their store to start and keep your garden looking great. This gardening center has grown from a simple greenhouse in 1922 to a full-service stop for both new and seasoned gardeners. If you are looking for a gift, stop in their gift shop or boutique. For help with irrigation or landscaping, the staff is ready to assist you and answer your questions. They even have all the equipment for a water garden, including, pumps, liners, aquatic plants, and fish. With such a great selection and location, this shop has something for everyone. Located east of Kirbyville, Missouri, this store feels like you are stepping into someone’s home that loves gardening. With a variety of hanging plants, shrubs, and flowers, you may want to bring a trailer or two with you to stock up for your yard. The staff is eager to assist you and help you with your installation and maintenance needs. With the slogan “making pretty, pretty easy since 1987,” this shop is eager to meet your gardening needs and provide excellent customer service. They offer a wide range of plants, full-service landscaping, and a loyalty club for you. So, if you are looking for a place that will reward you for your purchases, this is the store for you. Make sure to check out their website for their calendar of events to know what they are offering every month.